Like any city, it’s best to do as the locals do in Seattle. That means, in addition to buying flowers, catching fish or taking your wedding pictures at Pike Place Market, you have to know where locals go to eat and try their favorite food. Keep in mind that everything at Pike Place Market is F.L.O.S.S. (fresh, local, organic, seasonal, and sustainable). Over the next two hours, we sampled our way across seven local establishments at the Pike Place Market, an area known for its artsy roots and noteworthy food. When it comes to doughnuts, most Seattleites will say you Daily Dozen Doughnuts is the place to go. This place been around for years and continuously proves to be a town treasure. The moist, squishy and crunchy cinnamon doughnuts were my favourite! We stopped at the Urban Garden rooftop that provides fresh fruits and veggies to the Food Bank and Senior Center. When Yvonne Klein was a flight attendant for Air Canada, she’d spend stopovers in Sydney eating an amazing local yogurt. Its uber-straightforward name, the Greek Yoghurt Company, belied a gently tangy flavor so rich its memory lingered long after Klein was home in Seattle. She started bringing yogurt back for her husband, Bob. Then for their friends. The Kleins eventually flew to Australia to cold call the owners and, over four years, convinced yogurt maker Con Apostolopoulos and his attorney son, Alex, to leave Brisbane. This unlikely foursome now runs Ellenos Real Greek Yogurt. Located in the heart of Pike Place, Oriental Market is a family run restaurant that takes an innovative approach to many of its dishes. They serve classic Filipino dishes like chicken adobo, longanisa, dinuguan and gulay. 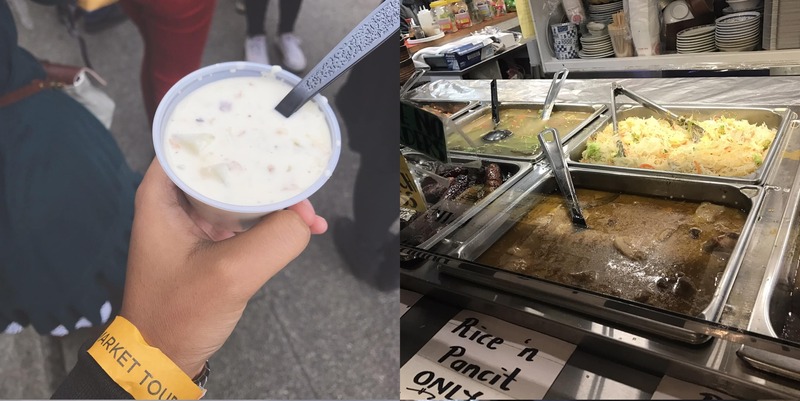 Winner for the”Nation’s Best Chowder” – three years in a row, Pike Place Chowder is a true splurge perfect for a very special occasion or a really impressive first date. The atmosphere is upscale without being overly stuffy, and the dishes are just as great to look at as they are to eat. Beecher’s Handmade Cheese was Seattle’s first artisan cheese company, opening their doors in the historic Pike Place Market in the fall of 2003 with a commitment to locally-sourced premium ingredients. Their cheeses are free of any articial flavors and preservatives and made with premium milk from cows that are fed high quality feed and not given recombinant bovine growth hormones (rBST) that are used by many dairy farmers to increase milk production. Their “World’s Best” Mac and Cheese also made it onto Oprah Favourite Things list. Walking into Pear Delicatessen & Shoppe feels like stepping back into time into a classic European bistro. This deli-style market serves chocolates, sandwiches and speciality drinks. With a balanced combination of local and imported goodies, they make the best sandwiches in town which you can wash down with one of their retro soda’s. Seafood fans rejoice because there are plenty of great options in downtown Seattle. One popular brunch place is Etta’s Seafood Restaurant. Beyond the great food and amazing history, there is just something about this place that has people coming back regularly. To get an insider’s perspective into Seattle’s history, food, culture and day-to-day life; sign up for one of the daily food walking tour with Savor Seattle. There are different tours to choose from. I did the ‘Signature Tour: Pike Place Market’ tour. We love eating our way around a city, especially where locals eat. Thanks for sharing these, perhaps I’ll be able to try one when we go back to Seattle.